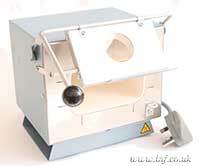 Small Enamelling kiln, is an ideal starter kiln for enamelling. Heats up and holds the temperature of 950C. Should be used with a temperature controller, this will extend its life and give you more constant results.